We're delighted to announce that the Bookshelf blog is to be turned into a book and published by Thames & Hudson. Dates are still to be confirmed but we will keep readers up to date with progress. Many thanks to all of you for visiting, suggesting and getting in touch over the last few years and I hope you will enjoy the book just as much. 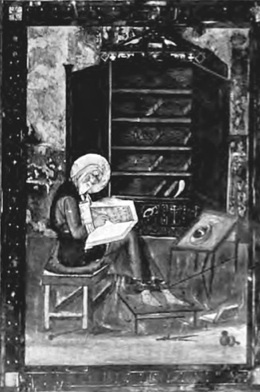 Pictured above is Ezra writing the Law, frontispiece to the Codex Amiatinus and featured in the groundbreaking bookshelf book The Care of Books by John Willis Clark. In the background is a press (an early bookcase) with open doors. The picture was probably drawn in the middle of the sixth century AD.